Attractive male form is made from easily pinned foam and covered in durable jersey material. Floor standing display form comes complete with adjustable base and neck block. Color: cream. Bases: metal, tripod wood, round wood. Muscular male display dress form is made from easily pinned foam and covered in durable jersey material. Includes adjustable base and neck block. Adjustable height up to 6'. Color: black. Bases: metal, tripod wood, round wood. Muscular male display dress form is made from easily pinned foam and covered in durable jersey material. Flexible arms and fingers add realistic features to this display form. Leg position base for flexibility to display jeans, pants, shorts, underwear. Includes adjustable metal base and neck block. Adjustable height up to 6'. Colors: black or cream. Attractive size 38 male form is made from easily pinned foam and covered in durable jersey material. Floor standing display form comes complete with adjustable base and neck block. Color: black. Muscular male display form is made from easily pinned foam and covered in durable jersey material. Floor standing display form comes complete with adjustable base and neck block. Color: cream. Bases: metal, tripod wood, round wood. Muscular male display form is made from easily pinned foam and covered in durable jersey material. Floor standing display form comes complete with adjustable base and neck block. Color: black. Bases: metal, tripod wood, round wood. Muscular male dress form is made from easily pinned foam and covered in durable jersey material. Leg position base for flexibility to display jeans, pants, shorts, underwear. Floor standing display form comes complete with adjustable base and neck block. Color: cream. Bases: chrome metal, tripod wood, round wood, black square metal. Muscular male dress form is made from easily pinned foam and covered in durable jersey material. Leg position base for flexibility to display jeans, pants, shorts, underwear. Floor standing display form comes complete with adjustable base and neck block. Color: black fabric. Bases: chrome metal, tripod wood, round wood, black square metal. Size 38 shirt display form is made from pinnable foam and covered in jersey material. Form comes complete with 14" dia metalbase, neck block, overall height adjustable from 39" to 50". Colors: cream; black. Mens size 38 display form is made from pinnable foam and covered in jersey material. Leg position base for flexibility to display jeans, pants, shorts, underwear. Form comes complete with floor base, natural wood neck block. Adjustable height up to 6'. Colors: cream, black, grey, white, oatmeal, tan. Base: rectangular natural wood. Male dress form with poseable arms and fingers, head turns. Leg position base for flexibility to display jeans, pants, shorts, underwear. Adjustable height up to 6'. Color: cream linen. Size 40 shirt display form is made from pinnable foam and covered in jersey material. Form comes complete with 12" square base, mahogany wood neck block, overall height adjustable from 39" to 50". Colors: cream, black, grey, white, oatmeal, tan. Base: square mahogany wood. Size 40 shirt display form is made from pinnable foam and covered in jersey material. Form comes complete with 12" square base, natural wood neck block, overall height adjustable from 39" to 50". Colors: cream, black, grey, white, oatmeal, tan. Base: square natural wood. Size 40 shirt display form is made from pinnable foam and covered in jersey material. Form comes complete with 9.5" round base, natural wood neck block, overall height adjustable from 39" to 50". Colors: cream, black, grey, white, oatmeal, tan. Base: round natural wood. Size 40 shirt display form is made from pinnable foam and covered in jersey material. Form comes complete with short tripod base, natural wood neck block, overall height adjustable from 39" to 50". Colors: cream, black, grey, white, oatmeal, tan. Base: short tripod natural wood. Size 40 shirt display form is made from pinnable foam and covered in jersey material. Form comes complete with floor tripod base, mahogany wood neck block. Adjustable height up to 6'. Colors: cream, black, grey, white, oatmeal, tan. Base: vintage tripod mahogany wood. Size 40 shirt display form is made from pinnable foam and covered in jersey material. Form comes complete with floor tripod base, natural wood neck block. Adjustable height up to 6'. Colors: cream, black, grey, white, oatmeal, tan. Base: vintage tripod natural wood. Size 40 shirt display form is made from pinnable foam and covered in jersey material. Form comes complete with floor base, natural wood neck block. Adjustable height up to 6'. Colors: cream, black, grey, white, oatmeal, tan. Base: rectangular natural wood. Size 38 shirt display form is made from pinnable foam and covered in jersey material. Form comes complete with 10" dia wooden base, neck block, overall height adjustable from 39" to 50". Color: cream. Attractive male form is made from easily pinned foam and covered in durable jersey material. Floor standing display form comes complete with adjustable base and neck block. Color: cream. Bases: walnut wood, maple wood. Size 48 (XL) male form is made from easily pinned foam and covered in durable jersey material. Floor standing display form comes complete with adjustable base and neck block. Colors: cream, black, grey, white, oatmeal, tan. Base: rectangular natural wood. Size 48 (XL) male form is made from easily pinned foam and covered in durable jersey material. Floor standing display form comes complete with adjustable base and neck block. Colors: cream, black, grey, white, oatmeal, tan. Base: tripod natural wood. Size 48 (XL) male form is made from easily pinned foam and covered in durable jersey material. Floor standing display form comes complete with adjustable base and metal chrome neck block. Colors: cream, black, grey, white, oatmeal, tan. Base: rectangular natural wood. Male dress form with poseable arms and fingers, head turns. Adjustable height up to 6'. Color: cream. Bases: metal, tripod wood, round wood. Torso Height with Head - 36"
Countertop male jersey form with poseable arms and fingers, head turns. overall height adjustable from 43" to 54". Color: cream. Counter Bases: metal round, metal square. Rolling base, male jersey form with poseable arms and fingers, head turns. Adjustable height up to 6'. Color: cream jersey. Bases: chrome w/casters, black w/casters. Rolling base, male jersey form with poseable arms and fingers, head turns. Adjustable height up to 6'. Color: black jersey. Bases: chrome w/casters, black w/casters. Muscular male display form is made from easily pinned foam and covered in durable jersey material. Floor standing display form comes complete with adjustable base and neck block. Color: black. Bases: chrome w/casters, black w/casters. Muscular male display form is made from easily pinned foam and covered in durable jersey material. Floor standing display form comes complete with adjustable base and neck block. Color: cream. Bases: chrome w/casters, black w/casters. Male display form is made from easily pinned foam and covered in durable jersey material. Floor standing display form comes complete with adjustable base and neck block. Color: black jersey. Bases: chrome w/casters, black w/casters. Male display form is made from easily pinned foam and covered in durable jersey material. Floor standing display form comes complete with adjustable base and neck block. Color: cream jersey. Bases: chrome w/casters, black w/casters. Size 38 shirt display form is made from pinnable foam and covered in jersey material. Form comes complete with round metal base, metal neck block, overall height adjustable from 39" to 50". Color: cream. Muscular male dress form is made from easily pinned foam and covered in durable jersey material. Leg position base for flexibility to display jeans, pants, shorts, underwear. Floor standing display form comes complete with adjustable base and neck block. Color: black. Bases: chrome w/casters, black w/casters. Male dress form with poseable arms and fingers, head turns. Adjustable height up to 6'. Colors: cream linen, black leatherette, black jersey. 26" long Flexible arms simply pin to an any dress form for realistic look. Sold in pairs only, pins are not included. Color: cream. Male display dress form is covered in non-pinnable leatherette fabric. Includes adjustable base. Adjustable height up to 6'. Color: brown checkerboard print. Bases: metal, tripod wood, round wood. Muscular male display dress form is made from easily pinned foam and covered in durable jersey material. Includes adjustable decorative metal base and neck block. Adjustable height up to 6'. Colors: black; cream. Male display form is made from pinnable foam and covered in jersey material. Form comes complete with adjustable wood base and neck block. Base can mount in the center or off center to display pants. Height adjusts from 50" to 60". Color: cream jersey. Male display form is made from pinnable foam and covered in leather-like or jersey material. Form comes complete with adjustable metal base and neck block, overall height adjusts up to 72". Colors: black jersey; black leatherette. Male display form is made from pinnable foam and covered in leather-like or jersey material. Form comes complete with adjustable metal base and neck block, overall height adjusts up to 72". Colors: white jersey; white leatherette. 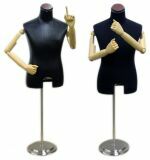 Male display form with posable arms is made from pinnable foam and covered in leather-like or jersey material. Form comes complete with adjustable metal base and neck block, overall height adjusts up to 72". Colors: black jersey; black leatherette. 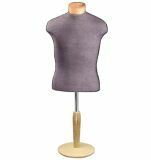 Male flexible mannequin with fiberglass head, body is made of soft foam with inside wire rod, covered in fabric. Arms, legs bend at any position. Detachable head, arms make them easy to dress. Color: cream fabric.